It's good news and bad news for PC shooter fans, who will be getting a Bulletstorm demo of their very own but not until after the game ships. Eyebrows were raised when Epic Games announced that a demo for Bulletstorm, the over-the-top arse-blasting shooter from People Can Fly, would be released on the Xbox 360 and PlayStation 3, but not the PC. This is the same game, after all, that Epic Vice President Mark Rein said in July 2010 "will be a full-blown, oh-my-god amazing PC game." Maybe he figured that and a Painkiller replay was enough to keep the mouse-and-keyboard crowd happy? Whatever his mindset, the situation has changed and Rein revealed on Twitter over the weekend that a PC demo is on the way, eventually. "Bulletstorm PC demo is in the works!" he wrote. "Won't make it in time for ship date but should be available shortly after." It's a little annoying, maybe, that console gamers have been playing the Bulletstorm demo for nearly a month while the PC crowd doesn't even know when it's going to get a shot at it. Speaking for myself, I'm happy to know that a demo is on the way; I just hope Mr. Rein and company don't mind if I wait to give it a spin before deciding whether or not to give them my money. 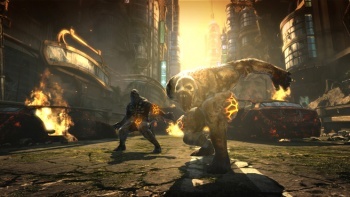 Bulletstorm comes out on February 22 - yes, that's tomorrow - for the PC, Xbox 360 and PlayStation 3.